I made this dish for the very first time just a few days ago, and it came out so good I must tell you about it. Normally I steer clear of dishes that I think will be very spicy. From what I know about jerk seasoning, it is quite “hot” since Scotch Bonnet peppers are usually amongst the ingredients. But on reviewing the ingredient list on the bottle of jerk seasoning marinade I became convinced that it would be OK. So I purchased the suggested brand: Lawrys Jerk Marinade, and proceeded with the recipe. 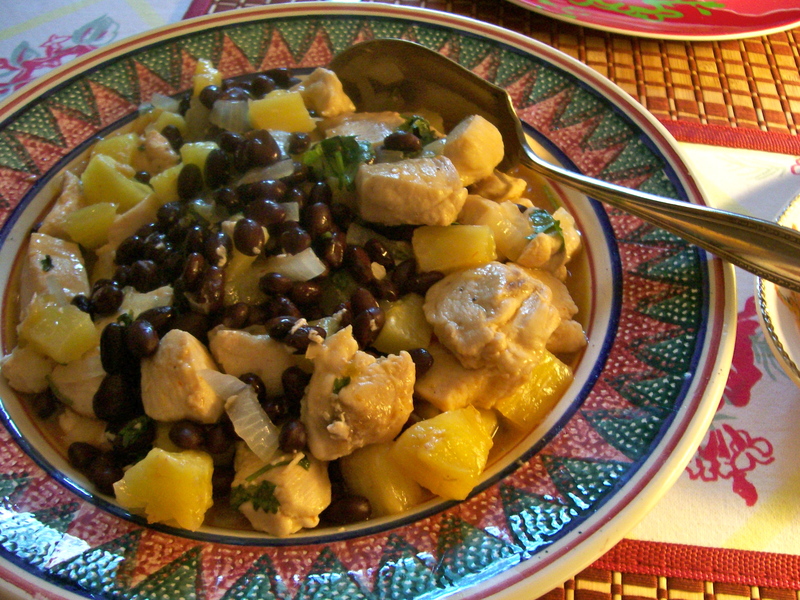 This is a one-dish meal featuring chicken breasts, pineapple, black beans, cilantro, onions and the jerk marinade served over brown rice. It goes together quickly once you have everything prepped. Mr. D., a person who likes spicy foods, was very complimentary when he tasted it. It does have some heat to it especially with the jalapeño chile in it, but I could tolerate and even enjoy it, so I know I will be making this dish again. 1. In a large pot of boiling, salted water, cook the rice, uncovered and stirring occasionally, until tender, about 30 minutes; drain. If using bagged rice, cook in boiling water 10-12 minutes, as package directs. 2. Meanwhile, in a large skillet, heat 2 tablespoons olive oil over medium heat. Add the onion and jalapeño and cook until the onion is browned, 7 minutes; transfer to a bowl. 3. Add the remaining 2 tablespoons olive oil to the same skillet and increase the heat to medium-high. 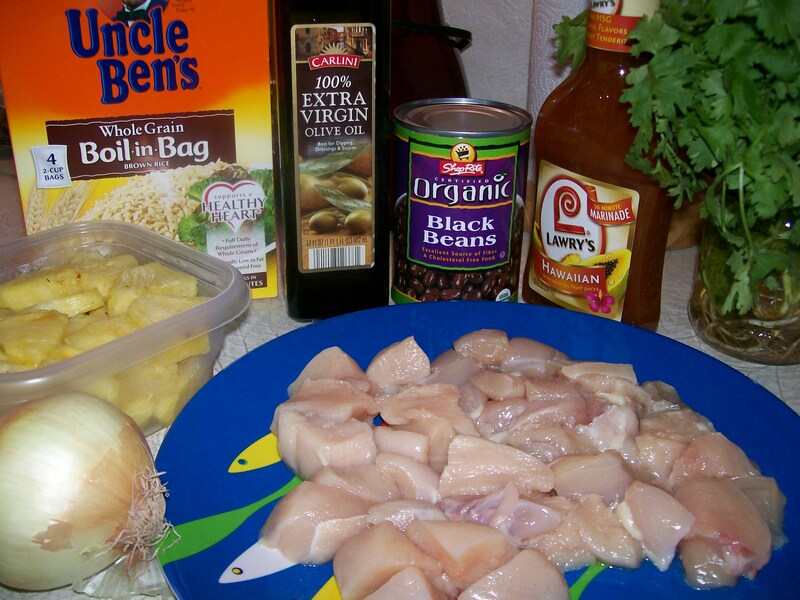 Season the chicken with salt and pepper, then add to the pan and cook until browned, 5 to 7 minutes. 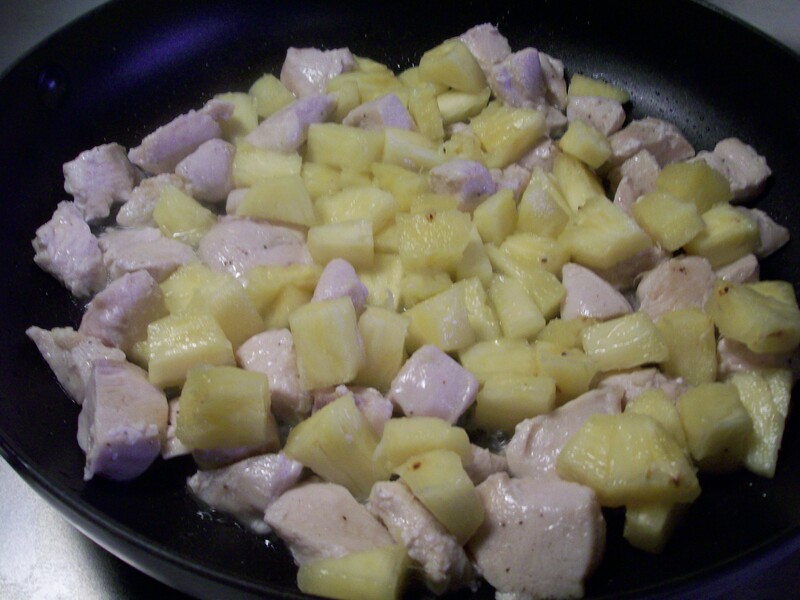 Add the pineapple and jerk marinade and simmer until the chicken is cooked through, another 2-3 minutes. 4. 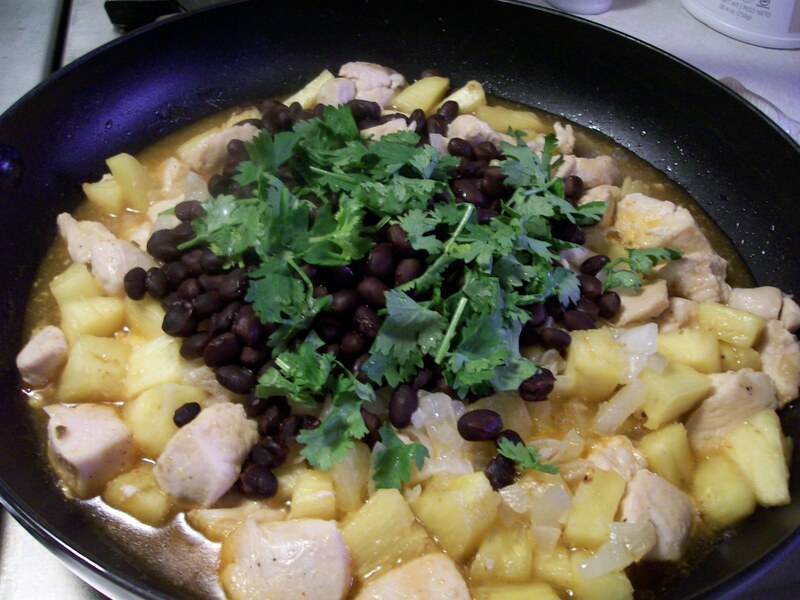 Stir in the onion mixture, black beans and cilantro; cook until the beans are heated through, about 1 minute. Season with salt and pepper and serve over the rice.